I'm looking to see if anyone can remember my Grandfather Edgar Huish who served as 1st Stoker on HMS Iron Duke, his name comes up on certain records, but only for the year 1918, so not sure if he served throughout WWI or just part of it, his son, my father Peter Huish who is now 81 has only recently told me of grandad's history of the war, so as I'm a keen historian and work in my local museum. I'm looking to make him a keepsake book about his fathers career etc. Any help whatsoever would be appreciated. Or even a few pointers on other records I might be able to trace him on. My great uncle was Edwin George Wareham (b: Feb 1890), who served on Iron Duke from March 1914 to June 1917. He was a Dorset boy, who had initially joined the Royal Marines Light Infantry division in Portsmouth in 1908. I have one sheet of service history from National Archives but nothing beyond that. Would love to find out what he did on board, any service medals, accounts or narratives - and photos. Is there a link to a crew list that you know of? My grandfather, Musician Charles David Croney, served on HMS Iron Duke. He enlisted into the Royal Navy School of music and became a musician, he later went into the Royal Marine band. He passed away in 1960. The Affiliated Army regiment was the Duke of Wellingtons Regt. His son also named Charles David Croney, served with the Duke of Wellingtons Regt. Sadly he was killed in 1944 at Anzio, Italy. My grandfather later served on HMS Birmingham the affiliated army Regt. was the Queen's own Hussars, of which I served with for 22 years. I still have my grandfather's diddy box that he had all those years ago I will post some pictures on this message board in the future. My late great grandfather was chief stoker on the HMS Iron Duke during the 1st World War, Thomas Medhurst. He maybe the gent with 144 on his shirt, but i'm not sure. 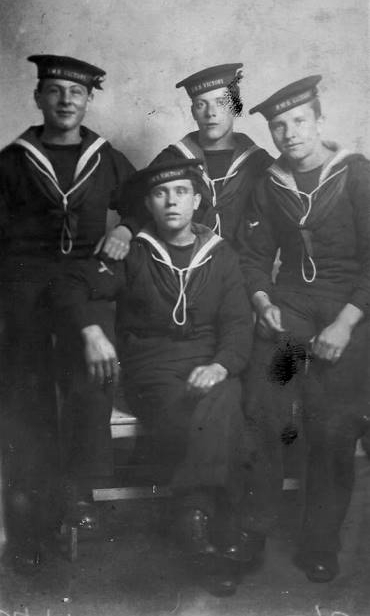 I am looking to identify these sailors of the British War Ship Iron Duke from November 13, 1918-Sept. 23, 1923 who part of the Mediterranean Fleet which occupied Constantinople during the Ottoman Empire. Can anybody help me? The small boy was my father and the small girl was his sister. They were Armenian Christians who later came to America and settled in Minneapolis, MN in the USA with their parents. My grandfather (Captain Robert N. Lawson) commissioned the Iron Duke as Flag Captain to Sir George Callaghan in April 1914 and subsequently remained Flag Captain with Sir John Jellicoe until October 1915 when he was appointed to the Light Cruiser HMS Chester. My grandmother kept a scrapbook and a number of letters. One is from the padre of the Iron Duke, John Gay, who writing to my grandfather immediately after the Battle of Jutland writes of his experience of the battle. He does not mention singing Abide with me, but does say he went down to the Medical Distribution Unit and got the 50 "Idlers" (those who had jobs which did not involve watches) to doff hats while he said a number of prayers. My late father, Reginald Joseph Whitworth, told me that he was on HMS IRON DUKE at the Battle of Jutland. He told me he was a Boy class two, and it was his duty to relay messages to Jellicoe from the wireless room. He stated that he took the message that Beatty was not going to meet the Home Squadron on time and was late. He also stated that as the ship went into battle the crew mustered on deck and sang “Abide with me.” I would dearly love to know the truth about this. His Naval history states that he was attached to Powerful from 11th Jan till 16th June 1916. His service number was J48989, he ran away from home and enlisted when he was 16 years old. There is no mention on his Naval record about this, also there is no mention that he was on trial for the submarine service at Rosyth. Any information about his career would be truly wonderful, or any help in searching for records. Recently my mother passed away and items of my wife grandfather have come to light. I am trying to find out the service record of my wife's grandfather J12313 CPO R. Wood. We have his bible which was presented to him on leaving HMS Impregnable in March 1912. His WO1 medals whilst serving on HMS Vivid. Photos of the Iron Duke's Engine room and various photos of the landings in Beckos and other locations. Also pictures of Athens, Turkey and Malta. Different navy sporting events. The Admiral coming on board the Duke on Christmas Day 1921. There are also references to other ships ie. HMS Exeter, Cornwall, Suffolk and Pegasus. Being an ex WO1 (Army) myself and my wife's grand father Robert Wood a quiet man as I remember would like any info. The LS&GC and WO2 medals were also awarded. There is also a photo of a J FOGUILL best wishes dated 16/10/1919. 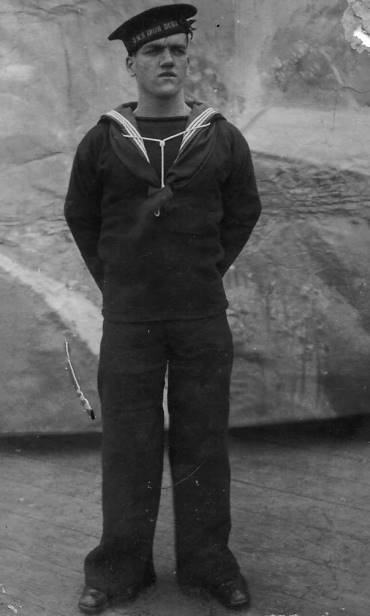 My grandfather, Henry Booth Rawding, I believe served on the HMS Iron Duke during the 1st World War and up to his death (natural causes, I think) about 1926, when my father was 7 years old. My father has recently passed away and the family history is very sketchy. I think that he served as a Petty Officer Stoker on board, but we have no information or pictures. He left Manchester to join the Royal Navy and subsequently HMS Iron Duke at Portsmouth. He married my grandmother (died 1957, I believe) whose maiden name was Earwacker. He then had five or six children Albert, Bertha (went to Australia about 1965), Gladys, Ernest (my father) and George. My father attended British Seamans Orphanage Brixham, Devon, from 1928 to 1933, I believe. Can anybody help with this? 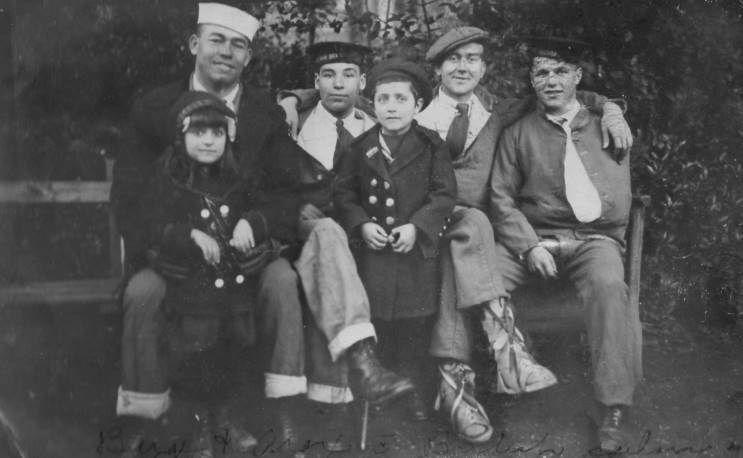 I have seen on your message board that you have a request for photos of stokers 1914-1919. My grandfather was a stoker on the Iron Duke at that time, his name was Benjamin "Ben" Sanders from Derby. 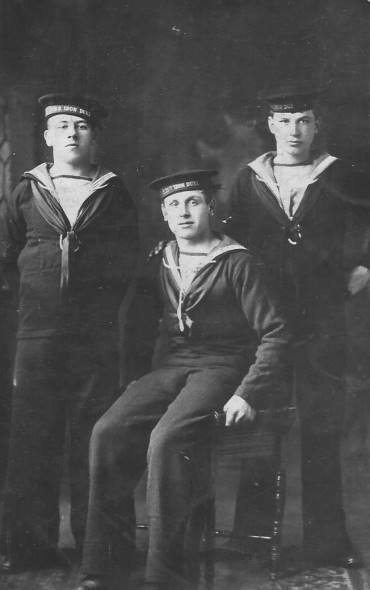 I have a number of post card photos of him with two other stokers (showing below). I saw your website on the computer, what I am asking is in my family's papers. My grandfathers mothers brother was on "The Iron Duke" his name is Joseph Adams and was a Petty Officer 1st class in the First World War, that's what has been written. Have you got any information at all, it would be lovely if you had a photo of him. A lot of photos of the family were destroyed in World War 2. I have been trying to put the family tree together, mammoth task. 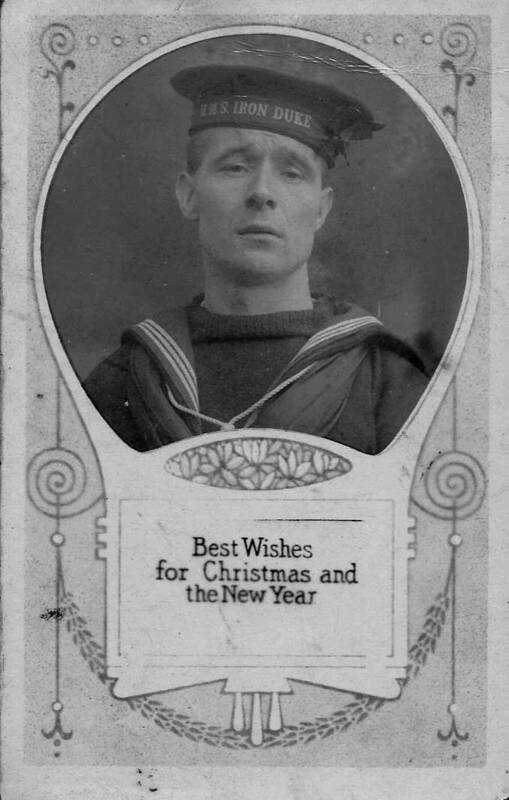 My late Grandfather was a stoker on board the HMS Iron Duke from 1915 to 1919. I have no pictures of him on board ship or in his uniform. His name was Henry George Edwards. Any information about him or pictures of the crew in this period would be great. I am seeking information about my father, Denis (Din) O'Sullivan, who served as a rating in the Iron Duke from 1940 (after his first ship, HMS Codrington) was sunk in Dover Harbour Din was born and lived all his life in Barry, South Wales. Does anybody know Din or anything about him? illness. He is buried on Malta at the Capuccini Naval cemetary. Does anyone remember Charles Bagley on the Iron Duke? He was born in 1901 started in Royal Navy ended up in Royal Marines. Was on the operation to get Prince Phillip out of Greece, but on arrived he was already gone. He also help train the Cockleshell Heros, he was my father served in both wars and died in 1977. I am attempting to find more information about my fathers Royal Naval career. I know he joined prior to 1914 as I have a photo of him in HMS Impregnable which was a training ship in Devonport, England. He then was drafted to HMS Iron Duke prior to the Spithead 1914 fleet review as a boy Telegraphist. He joined the ships boxing team after a run in with the ships PTI (Physical Training Instructor) ashore one day. This lead to him boxing for the ship a few times. I note that you had a request for a ships crew list for the 1914 period, if you were successful in obtaining one I would be very interested to know were from, if it is still possible to get a copy of it and/or if a Boy Telegraphist by the name of James R. Stoneman appears in it. He might even appear as a defaulter for missing a message on the Telegraph system, which eventually lead to him being dismissed the Royal Navy on medical grounds. I have just found my father's navy records and am working through his RN history. 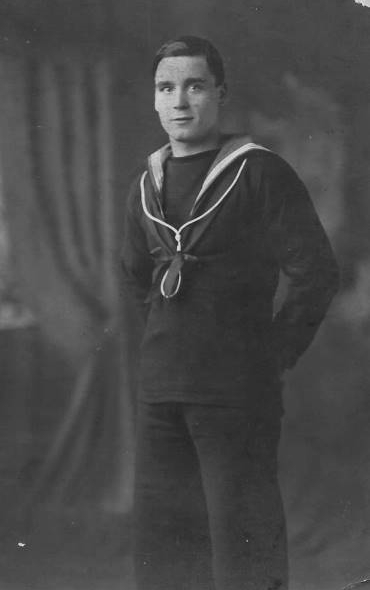 My dad, Arthur Stanley Wood, joined the ship (HMS Iron Duke) as a boy 1st class on 29th October 1923 and left as an Able Seaman on 9th March 1925. If i'm interpreting his records correctly, his ships record number was 518. He went on to serve in the RN right through to 1945. I have been trawling the net for information about this period of time to no avail, can you or any one help by telling me what the ship was doing between these dates? My Godfather, the Rev Meiklejohn was the C. of E. Priest on the Iron Duke at the battle of Jutland. There was also a R. C. Priest, Irish I believe. My question is, who was he? My Godfather told me a story of what the two of them got up to at the time, something I am attempting to recreate. Helps to know who they both were. Any ideas most welcome. Hello I just found your site and i'm over the moon that i've found a few pictures of two of the ships my great grand father served on! He was in the navy for 28 years in all. He served on the Iron Duke for some years during the First World War. He was a diver/deckhand. He then left the navy after the war had ended to get married. He was then called up to rejoin as the Second World War started and as far as i'm aware he was on HMS Keppel. I think he served till 1944? His name was Thomas Robbinson. Your site is Fantastic im very gratefull for all you hard work. 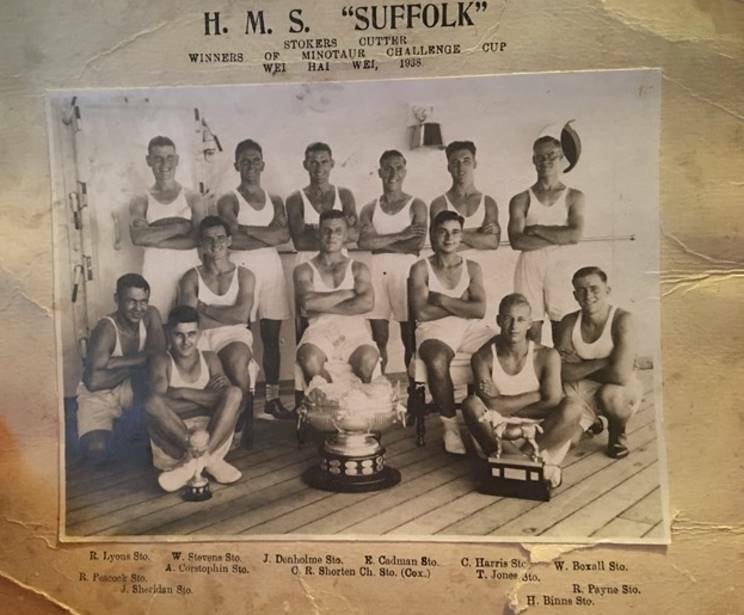 We are also looking for a relative who was on HMS Iron Duke bet 1915-1919, Chief Petty Officer, Sydney James Goodwin and having similar difficulties. Thank you for the wonderful photos, but names to go with them would be fantastic! 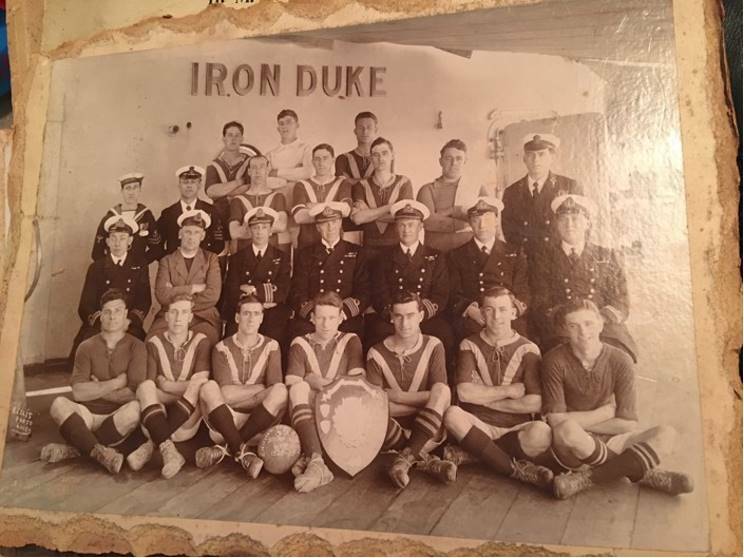 My father served on the Iron Duke in the 1920s. He married my mother in Smyrna in Aug. 1920. Was the Iron Duke involved in the 1919 landings of Greek troops? That can only explain how they met. She was a local Jewish girl and was taken onboard the ship as a refugee in 1920. For what reason, I do not know. My father, Herbert Eli Smith, would have been an ordinary rating at the time. I would appreciate any information that can be gathered. I am attaching a photograph upon which I would request your comments. 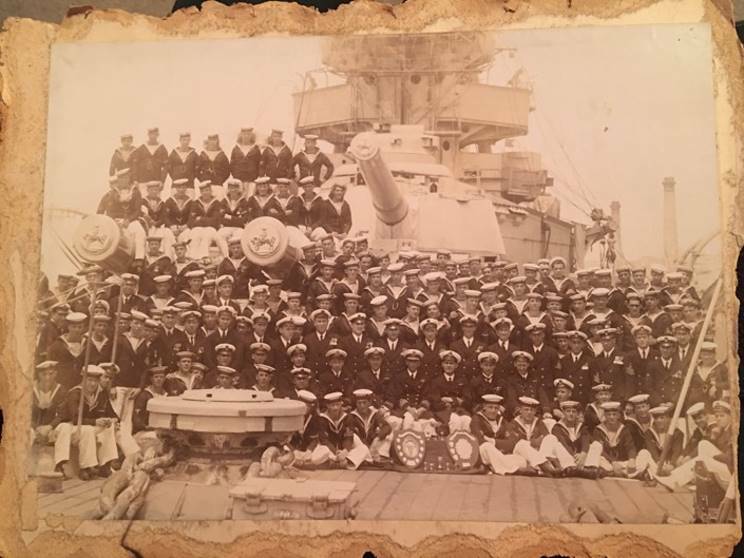 The inscription along the bottom says: "TEDDY BEARS" BORN (E).1N HMS IRON DUKE 28th NOV 1918. One of the chappies shown should be Frederick William Fletcher. What is the significance of "BORN (E). 1N"? Who or what were the "Teddy Bears"? Are there crew lists available for the Iron Duke for this period? Any info gratefully received. The gentlemen in the picture were probably in the northern regions because duffle coats were the then cold weather garments. My thoughts on BORN(E). 1N. The word 'borne' has several meanings but one of them is to bear or carry. We in the RN were always in a warship not on it. So the play on words may come into play here!!! So 'borne in Iron Duke' may be the caption. Borne = bear (maybe). Or wearing a fearnought suit makes one look like a bear!! I have made some enquiries and so far the massive response has been zilch. No less that 42 maritime enthusiasts have responded "HUH ?". 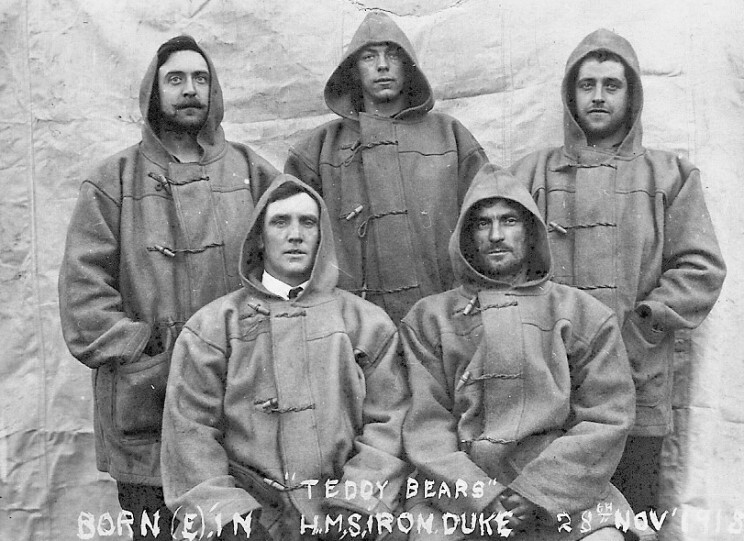 I have no information but speculate: Wrapped up in their camel coloured duffle coats they do look a bit teddybearish, is it just a joke reference to a group of chums since the name is in quotes "TEDDY BEARS" an illusion rather than a given name for an identifiable association. Might BORN (E). 1N be another jokey reference. Since it is all written in upper case it is difficult to say whether my next theory holds water. Could Born(e) relate to ship's company messes where ratings were .......borne. In which case the illusion to Born (ie came into being) evolves to Borne (ie carried or messed) in Ships Company Mess No. 1N. Sorry not to be more authoritative - best I can come up with. Do you have crew listings or any photos of the crew members from 1914-1918? I am particularly interested in the Marathon team, of which my late Grandfather was a member. He was Richard Devlin and I think he was a Stoker (Mem) 1st class. Could you also furnish me with any info of the ship's movements from this period. 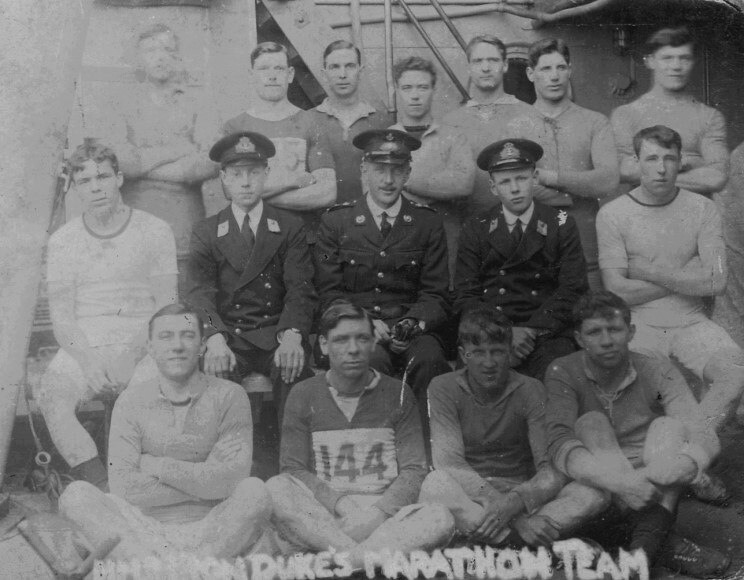 Marathon team from HMS Iron Duke, Richard Devlin is seen first on left, front row.